A bit off topic as there's nothing directly Android-related here, but interesting nonetheless: JD Power & Associates has released their findings for the Q2 2010 Wireless Smartphone Satisfaction Study, and Apple, Motorola, and HTC have grabbed the top spots (respectively), all landing above the industry average of 764 points (out of 1000). Coming in below average? 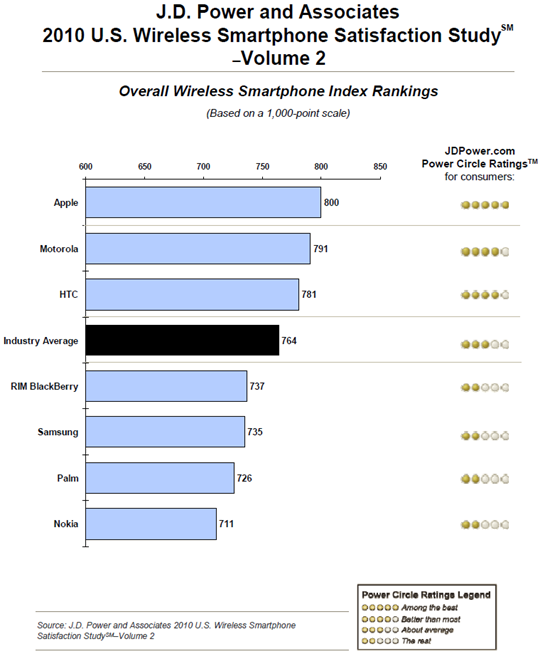 RIM (Blackberry), Samsung, Palm, and in last place, Nokia (note: not all companies are shown, just the big dogs). The results are still fairly close, though - Apple (at #1) scored 800, while Nokia (last, #7) scored 711 - certainly not a lot of variation. It shouldn't really come as a surprise that Apple ranked #1, given the rampant popularity of their devices and the fanboyist following around iDevices. However, that Motorola scored second (at 791 - just 9 points less than Apple) is surprising to me; then again, with the huge popularity of the Droid (remember, these are Q2 results), it's certainly possible that part of their success can be attributed to Android itself. Also surprising was that Samsung only managed fifth - in my personal experience, they make some good, quality devices (especially compared to Moto). There you have it, guys - the masses have spoken. Agree? Disagree? Let us know below!